IT'S HERE! I promised ya'll a massive gift guide for EVERYONE on your list this year! Including those pesky little teenagers who are so hard to buy for! Can I be honest for a sec and tell y'all that I love buying gifts for friends & family? I know that's not what the season is about but it makes my heart so happy & full to buy something for someone else, just because. Which is why I really do put a lot of thought into my gift buying and these guides! I want you to give a gift you know that person will just LOVE! So, today I bring you...THE ULTIMATE CHRISTMAS GIFT GUIDE! While this guide isn't yet complete and I plan to add things as the month goes on, I wanted a place to gather all the best gifts of the season for you to easily shop. I tried to find a few ideas for those people that are the hardest to buy for first and the ones you guys have requested the most! Let's get started with the hardest people on my list to buy for. My oldest, Nick, who is 15. His Christmas list this year included a few things that surprised me. But after thinking about it, made complete sense! other gift ideas for teens include games, cash, gift cards to their favorite places to eat, a camera, or simple things like a wallet with a few $10 gift cards inside. it's actually a decent list, and a lot of these things work for both boys AND girls! I found a great deal on UNDER ARMOUR & NORTH FACE hoodies here and you can use code Take20November for 20% off your order through the end of the month! I also love the idea of a personalized throw blanket like this one, or this one. Now that the hardest is out of the way, the second hardest for me is thinking of gifts for my in-laws, and my parents. Over the years, I've found that things like, slippers, and candles however boring they may seem, always make good gifts. I've yet to meet someone who doesn't love candles or comfy slippers! i get a pair for my mom every single year and she loves them! I'm adding a few gifts to scroll through for the woman in your life, followed by gift ideas for the guys. If you want to get a joint gift, I really suggest something like a google home mini, or an amazon echo. We really love ours!! They would also make great gifts for teens since you can also stream music on them. Moving back to kids- Savanna pretty much wants anything and everything this year as do most 5 year olds. I've been watching the things she plays with the most this past year and thinking of that while sharing her wish list with you! The number one thing Savanna wants Santa to bring this year is this melissa & doug grocery store set. I really love gifts that encourage imaginative play! She has had this vintage kitchen set for 4 years and absolutely loves it! It is great quality and has held up so well! She also really loves her vanity and playing dress up! Santa brought this set of 5 princess dresses last year and she absolutely adores all of them! It's a great set if your little one loves to play dress up! She also really loves anything to do with art, painting, coloring, art kits, cutie cars, mini figures, princess dresses and board games! If you exchange gifts with your bestie, here are a a few really fun ideas, besides just exchanging a bottle of wine, which is also acceptable. Presco Pong is a MUST! We always do a big family gift every year, some years its a few board games, one year it was a popcorn cart, another year was a movie projector & screen and last year we got the ninteno switch with mario kart 8. It's usually always a gift that encourages us to spend time together as a family! It's my favorite gift to buy! and last but not least, I've been getting asked to share what's on MY wish list this year, besides candles, more slippers & throw blankets. So for fun, I'm sharing things I'm wishing for this year below! I really realllllly waes nt a SMEG TOASTER, some L.L. BEAN slippers, BAREFOOT DREAMS cozy chic throw blanket, more of my favorite perfume, EVER and any and everything from LUSH! I'll probably just buy all of this stuff for myself anyway, because that's who I am as a person. It's fine. OKAY. So that was really specific but its fine. HA! The amount of messages I've been getting from husbands/boyfriends this week has me laughing so hard, mostly because they'll be like, "you shared a scarf and my wife told me to come to your page to find it..can you help me?" TOO funny, so I thought it might be beneficial to set up a section just for them, and hopefully make their lives a little easier. So if you're a hubby here reluctantly shopping for your wife/gf this section is for you.. but it's also for anyone searching for gifts for the cozy lover in your life! I'm planning to keep this post updated through the season! So check back often for sales & deals on my favorite gifts of the season! I can't thank you guys enough for your continued love & support! It means SO SO SO MUCH TO ME! 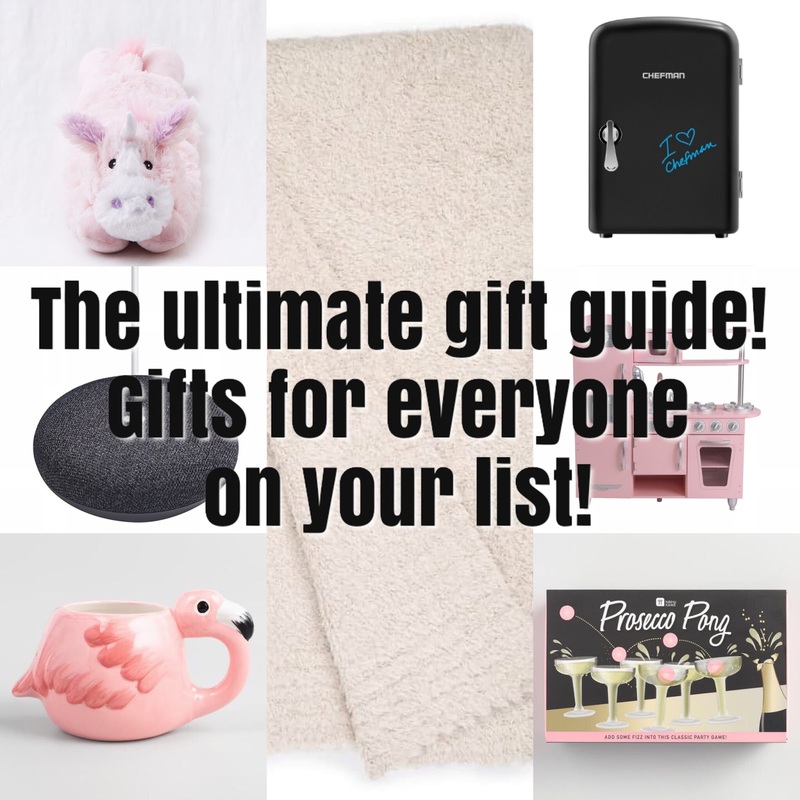 I would love to hear what you guys think about this guide and would love to hear what you're buying as gifts for everyone this season! These are such great ideas !!!! Thanks for all the hard work you put in to making life easier on us !